For years, it has been understood that obesity increases the risk of diabetes, heart disease, respiratory issues, breast cancer, prostate cancer, and colon cancer, as well as high blood pressure. However, a recent study has also shown that obesity also puts patients at a higher risk of developing periodontal disease. If you suffer from obesity and have begun to develop periodontal disease, your dentist can help you determine the best way to treat it. The goal will be to reduce plaque and inflammation in and around your gum line. They will insist that you maintain a strict home regime, including flossing regularly and brushing at least twice a day with an antibacterial toothpaste. In addition to treating the periodontal disease, your dentist can help to determine the cause of your obesity and may refer you to a physician for further treatment. Obesity compromises a patient’s overall health. It’s important to make sure you’re taking every step possible to maintain a healthy weight. Exercising and getting the right kind of nutrition is imperative to keeping your body and your teeth strong and healthy. 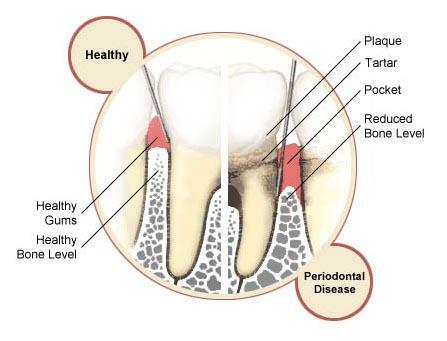 Obesity is on the rise in the United States and so is periodontal disease. Due to poor nutrition and eating habits, more and more people are falling victim to these chronic diseases. Some specialists and professionals estimate that nearly 60 percent of American adults are overweight, and many claim that this number will continue to rise. If you’re worried about your oral health or overall health, speak to your dentist or other health professional today.